Scalisi Skincare is a highly innovative prestige beauty company focusing on beauty, health and prevention. They create scientifically proven products that look and feel beautiful. Scalisi has created the first anti-aging moisturizer combined with the lightest feeling, FDA approved, SPF 30 formula ever - the linchpin in preventing wrinkles. By explaining simply and factually why things work, Scalisi is able to deliver to consumers products they can understand from a company they can trust. See our Q&A with Jill Scalisi, Founder and CEO of Scalisi Skincare. Years of meticulous skin healing research have gone into the patented and trademarked peptides used in Scalisi Skincare. These peptides convince the brain that a wrinkle is a cut and react by calling in more collagen to essentially "heal" the wrinkle. By reconnecting the broken collagen chains, the skin's supple foundation is restored. Scalisi Skincare products boast a powerful combination of two synthetic peptides. While effective individually (6% and 57% respectively), their one-two punch increases the look of collagen production by more than 250%. Now that's teamwork. PAL - GHK, a synthetic peptide containing three amino acid residues. Glycine, histidine and lysine target collagen and skin thickness. PAL - GQPR, a synthetic peptide containing four amino acid residues. Glycine, glutamine, proline and guanidine target elasticity and hydration and firmness. When you're looking to improve your skin, you should look at the ingredients that you're using. Some skin care products feature harsh ingredients that can negatively impact your complexion, leaving it damaged instead of calmed, soothed, and cleansed. Scalisi Skincare Products feature a range of formulas that gently treat and nourish your skin, helping to pave the way for a truly healthier complexion. Choose from a number of products in this line, from moisturizers and cleansers to eye creams, which help improve your skin care routine. Scalisi Skincare Products go beyond traditional products and deliver extended benefits. Your cleanser can double as your exfoliator, which can gently create one of your most beautiful skin routines yet. Your moisturizer does more than just hydrate your complexion; it can also deliver proven anti-aging benefits, minimizing the appearance of wrinkles and maximizing your skin's beauty. A more beautiful complexion is just a purchase away thanks to Scalisi Skincare Products. If your current beauty routine leaves something to be desired, make a change. Scalisi Skincare Products can revitalize and rejuvenate your daily routine, allowing you to create skin that looks healthier and younger. Fighting aging and nourishing your skin doesn't require harsh or irritating ingredients. Turn to Scalisi Skincare Products for all of your beauty needs, and enjoy the healthier, brighter, and younger-looking skin. Scalisi Skincare Cleanser and Exfoliator is a dual-purpose product that allows you to cleanse and exfoliate in one simple use. A variety of soothing, natural ingredients combine to eliminate impurities from your skin while removing the dead skin cells that can result in a dull appearance. Vitamins A, C, and E nourish your skin while delivering important antioxidant protection. Jojoba and sunflower oil moisturize your complexion, soothing it at the same time. All skin types can benefit from this paraben-free formula. Scalisi Skincare Anti-Aging Moisturizer SPF 30 minimizes collagen and elastin breakdown using the brand's proprietary tri-peptide technology to create smoother, firmer, and younger-looking skin. Clinical tests show that this daily moisturizer can minimize the appearance of wrinkles by up to 45% in just eight weeks. In addition, you can enjoy broad spectrum SPF 30 protection every day, along with brighter skin thanks to white tea extract. This paraben-free formula is suitable for all skin types. 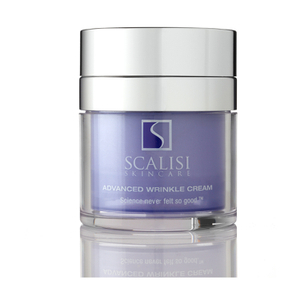 Scalisi Skincare Advanced Wrinkle Cream is a rich moisturizer that works well for extremely dry skin. Use this anti-aging cream as a night cream, allowing you to moisturize your complexion as you sleep. Enjoy the moisturizing benefits of Squalane, macadamia, and hazelnut oils, which combine to hydrate, firm, smoothen, and nourish your complexion. Normal to dry skin types will benefit from this cream.